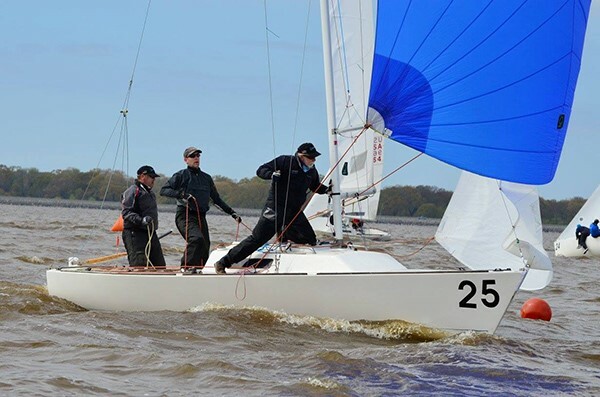 This year’s J/22 Midwinters were the first time that I and a lot of people sailed a major regatta at Jackson Yacht Club. Having sailed there a few Saturdays and Sundays over the years, I had an idea of what to look for, but it was only a tease. Ross Barnett Reservoir, or the REZ as the locals call it, is a better-than-average size lake with a fairly open area for racing. If you think this would help settle down the wind on the course, you would be sorely mistaken. It was one of the most challenging places to race that I have been to in a while. Fun, but challenging. Before the start of the regatta, I had enough time to do some one-on-one coaching with crews that arrived early. One area that we worked on was tacking and gybing for boat handling. I found the majority of helmsman would turn the boat too quickly. Turning too quickly has many drawbacks, including moving the rudder more than necessary, making it hard for the jib trimmer to keep up, and making it tough on the foredeck person. Experiment some with slowing the turn down and keeping the rate of turn smooth. Make sure you are turning the same rate from tack to tack. In lighter wind, the tacks need to be faster to get the boat from one tack to another quickly, but I think as soon as you get everyone on the high side you can slow down your turns. Give it a shot. Regardless of your sailing location or conditions, there are always a few things you can do to prepare for any race. Here are some tips that will help move you up the ladder in any fleet. 1. Win your side of the fleet first and everything should work out. Simply put, no matter how fluky the winds are, by the time you get to the windward mark even the leader of the bad side will end up in a pretty good position. I am not saying one-tack the first beat, but while playing the shifts be aware not to lose track of the boats on the same side of the course. You may need to tack on smaller headers to get back in touch with your competition, but in general that is better than sailing across the middle of the course. 2. When in doubt, stay with the group. This applies the most when sailing downwind. This has happened to all of us at one time or another: you have just rounded ahead of a pack of boats and want to work low. You get frustrated with the following group sailing high to keep their air clear. Tired of working up to protect your wind and giving away distance, you gybe away. Do you have a reason for this move? If you see a puff, great, this should work out fine. However, the percentages would favor heading up – keeping your wind clear and waiting for a real reason to gybe. Be prepared to give up distance, not boats. 3. Stay out of the middle of the course. This is an easy one. My crew calls the middle the “Cone of Death,” so that gives you an idea of how much they like it. 4. Concentrate on your job. On our boat we have a good idea of everyone’s jobs and responsibilities. My first and most important job is to steer the boat. Yes, I have to trim the main and play the backstay, and sometimes the traveler, but driving takes priority over everything else. Don’t be shy about talking about who is supposed to do what.